When the IAAF announced the new IAAF Hammer Throw Challenge last November, I was skeptical. My mindset was already biased and bitter because the hammer throw was not included in the Diamond League, but hearing about the new Hammer Challenge only made me feel worse about the future of the event. I felt like someone was selling me dirt and calling it a diamond. The initial announcement for the Diamond League six months earlier had the opposite effect. I was excited. The Golden League often held only one, if any, throwing events. The Diamond League, on the other hand, offered more opportunities for the throwers. In the initial press release, IAAF President Lamine Diack even said, “It is great for me to be able to announce that all events* of our sport will be touring around the world.” But, as I read on, I realized that ‘all’ did not mean all since an asterisk had been inserted into his quote. That’s the first time I’d ever seen an asterisk inserted into a quote from a press release before. As I scrolled down I was informed that that Diamond League was very distressed that they could not include the hammer throw in this new series due to ambiguous “infrastructure” reasons which have yet to be clarified in the last 18 months. However, the IAAF promised a new hammer throw challenge to help compensate the hammer throwers for being kicked out of the inner circle. Maybe, I thought, things would turn out okay. After details of the Hammer Challenge finally emerged in February, it became clear that we had been screwed. What actually hurt the most was that the IAAF tried to spin it as a gift to our sport with a headline reading, “IAAF throws weight behind Hammer discipline with $202,000 purse.” That is indeed a large amount of money, but it isn’t any more than the hammer throwers were receiving under the old system. Rather than “throwing its weight” behind the hammer throw, the IAAF was pushing it to the periphery of the sport as the other throwing events got promoted to the big leagues. To get into the details, the new series did not really create any new opportunities for hammer throwers. Most of the meets included in the “hammer challenge” had already hosted the hammer throw in previous years. And, to make matters worse, not only was the hammer throw relegated to the second tier meets, but it was by far the worst paid event at the second tier meets. For instance at the Zagreb meeting the winners of every international event earned $4,000 to $5,500, except the hammer throw which took home just $2,000. This was the case at every meet. While there was a year-end jackpot to supplement this, previous years allowed athletes to earn just as much money at the World Athletics Final. Libor Charfreitag is not a fan of the this year's new IAAF Hammer Challenge. Photo from TopAthletics.org. Of anyone, I would think Charfreitag might be happy with the current system. He placed third in the series, entitling him to a $14,000 bonus. Including his prize money from each meet, he earned $19,200 from the series. But, that is barely enough to pay the bills for the season considering the seven meets on the circuit represent virtually the only money making opportunities for a hammer thrower. To put this in perspective, the winner of each Diamond League meet in the discus (or any other event) took home $10,000 and top high jumpers are complaining that this isn’t enough for them to make a living. In addition, being in the Diamond League exposes the athletes to more fans, making them more attractive to sponsors. But matters get worse. Charfreitag is at the top of the food chain. My training partner Sultana Frizell fared worse this year under the new Hammer Challenge. Despite placing 10th at last year’s world championships and breaking her own Canadian record this May, she was only invited to two of the seven Hammer Challenge competitions. Most of the meets featured the same 4 or 5 top athletes mixed in with some local talent. Anyone outside of that pool had to sit on the sidelines. To make matters worse, the meets were spread out over four continents and six months. The final standings were based on each athlete’s three best results and Sultana still placed 12th with just two meets. However, she wasn’t awarded the twelfth place prize since she did not have the requisite number of meets. This is one of the world’s best athletes, and she barely received any money from this series. In talking with her, she earned more last year under the old system and much of her prize money this year came from a non-Hammer Challenge meet: the Prefontaine Classic. And it all continues to trickle down. Without opportunities at the top meets, Sultana seeks out opportunities at lower paying meets, pushing athletes at my level out of the picture all together. I asked Libor if he has any suggestions for improving the series and his reply was short and simple: “YES! 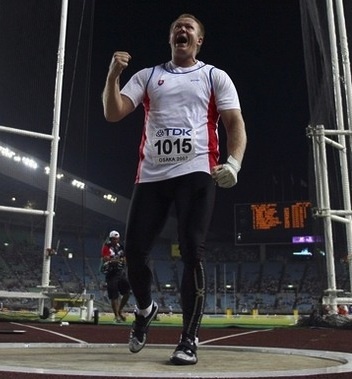 One and only- make hammer throw part of the Diamond League!! !” He’s right. If the IAAF wanted to support the event, it would have tried to include it in the Diamond League with every other event. In the alternative, they could have created a hammer challenge that at least paid the athletes comparably and highlighted the event. Instead, they did neither and never even gave a reason for their decision. Libor mentioned to me that if the meets are looking for publicity, records, and fans, the hammer throw is the perfect event. Only one women’s event had a new world record this year: the women’s hammer throw. But rather than being thrown in front of the world, it was thrown at a small meet in Bydgoszcz, Poland. The free publicity that comes with a world record was lost because of this. The women’s hammer is a young event that is ripe for attention, but isn’t even given the opportunity to shine. Hopefully the IAAF and the Diamond League will come to their senses before the hammer throw drifts off into further obscurity and another opportunity is lost for track and field. Couldn’t agree more! The hammer throw has every potential to be just as exciting as any other event! Leaving it out of the Diamond League is a big loss for track and field! I reached the conclusions you came to even before the season started. When they originally announced the Hammer Challenge it was obvious what was going to happen. If you run the table (win all 7 meets) a hammer thrower will make $44,000 USD. If you do the same in the Diamond League you win four times that amount. No one living in the US, Canada, or Western Europe can live off of this. It will slowly kill the event. The only future for the event is to have the hammer in big meets (which are in rich countries) and the irony is that no one from these countries can afford to stay in the sport with so much money being taken out of it. It appears that the IAAF thinks it is helping the event by having the Hammer Challenge when through it’s actions it is doing exactly the opposite. Hey Don – Yeah, I came to same conclusion too when I first wrote about the details this winter, but it’s worth restating what a raw deal this is. I don’t want anyone to think that we forgot that we are the only athletes excluded from the Diamond League. Even if the hammer were added to the Diamond League with a reduced payout, it would still be a plus since it would give the athletes some more exposure and might help them in the sponsorship arena. Martin, have you thought about contacting anyone from the IAAF with your thoughts? This blog entry alone would give some of the IAAF bigwigs our perspective on how hammer throwers got screwed this year. We can make noise amongst eachother all we want but we won’t make any changes unless we make noise to the people at the top. I suggested you contact the IAAF because you can state your thoughts a bit more eloquently than I could 🙂 Though if thats something you’re interested in I’d be willing to help find e-mails, phone numbers, or whatever to get the ball rolling. Commentary on the world of sport and throwing.